These pages await the thoughts and insights that make each person unique, offering a safe place for journalers to write their very own stories. Whether days are full of blessing or lessons, taken together they reveal an amazing, authentic life. Our activities, thoughts, and impressions are the words and phrases that shape our story. Through Scripture verses, God’s love and grace are written into every element of the plot. Verses and quotes inspire us to record, reflect, and remember all the days that are written in the book of our hearts. Every woman has a God-given story that defines who she is. This journal is the place she can write it out. 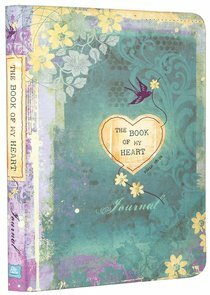 About "Journal: The Book of My Heart"